David Smith shoots 195 feet in Tampa, FL on March 13, 2018 breaking his own Guinness World Record. See David Smith Jr. break the Guinness World Record for the highest Human Cannonball shot. David Smith breaks the Guinness World Record for the farthest Human Cannonball Shot in Milan, Italy 10 March 2011. See David "The Bullet" Smith perform on Season 7 of America's Got Talent. David Smith Jr. performs at the Calgary Stampede July 8-17, 2011 in Calgary, AB, Canada. A portrait of David "The Bullet" Smith Jr.
A portrait of world record holding human cannonball, David "The Bullet" Smith Jr. Directed by Jordan Bahat. See the Human Cannonball perform for the West Michigan Whitecaps at Fifth Third Ballpark! See David "The Bullet" Smith's post game show at Nashville Sounds. Think the Human Cannonball is Awesome? 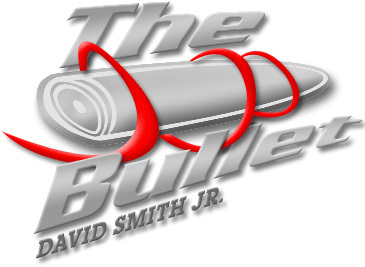 Book David "The Bullet" Smith at your next event!